Four-in-ten people now fear for their safety at public events like music concerts and Christmas markets in the wake of recent terror attacks, new research has found. A report produced by ATG Access states that these worries are so high for some people it’s actively preventing them from attending public events altogether. 29% of the public said they now will not go to large events taking place in the UK due to concerns around the levels of security in place. Two-fifths (41%) of individuals also said they’ll not attend events if they think they will be overcrowded through fear that it would be harder to leave if an incident was to occur. Residents in London and the West Midlands are most worried about event safety, with 46% of people in each region expressing this concern. Overriding worries are also echoed in the North West (42%), where attacks have recently taken place, and in Northern Ireland (41%) and Scotland (37%). Concerns around overcrowding are at the highest in the East Midlands (57%), followed by London (46%), the South East (46%), Wales (44%) and Yorkshire and the Humber (40%). The study was conducted as part of ATG Access’ ‘Protecting the Future of Multifunctional Cities’ report, which looks at how cities in the UK are being transformed into bustling multi-functional spaces, and the obstacles that are preventing public events from taking place. Integrated Security Consultants (ISC) has been awarded the contract to provide security services to one of the most fascinating, curious and exclusive new venues situated in the heart of London: the recently-opened Victorian Bath House. Featuring a secluded Victorian Courtyard and many original features, much of the building is situated underground, including a Grade II-listed Bath House, yet it’s located on a busy street close to Liverpool Street Station. ISC will provide assistance to the event teams at Camm & Hooper, the events space specialist. The venue, which opened on 1 December last year, will accommodate up to 150 guests and be used for a wide variety of private and corporate events. ISC’s role will include providing corporate security officers for all events at the Victorian Bath House. The security team will offer a complete security service in a manner which befits this unique and special venue providing customer excellence. ISC already provides services to two other iconic Camm & Hooper venues: the Banking Hall, situated in the City, which holds events for up to around 800 guests, and the Tanner Warehouse near London Bridge Station (host to a bar, restaurant and venue space). The company also works on a range of corporate events at Wembley Stadium and provided the security support to hospitality events at the 2015 Rugby World Cup. 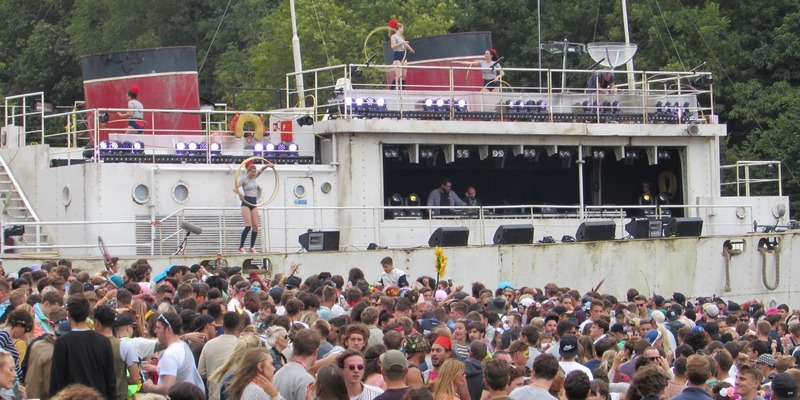 The ‘Best-Ever’ Bestival ensured that another busy summer programme of securing and managing crowds at major festivals ended on a high note for Showsec as the company played its part in the success of the ‘Summer of Love’. 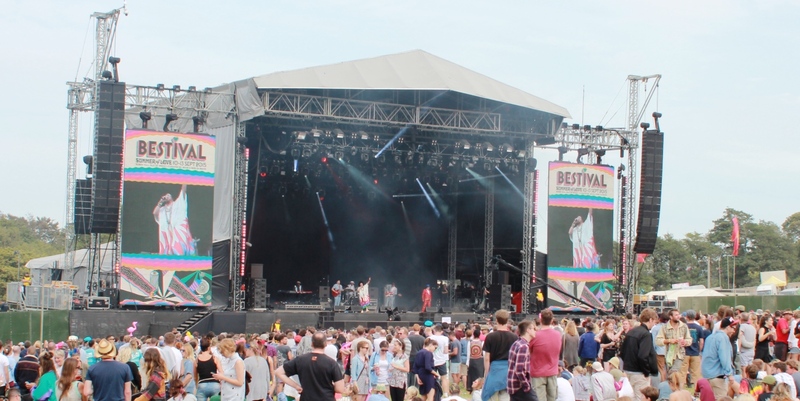 Organisers were quick to acclaim the fact that Bestival scaled new heights this year following a spectacular event which once again featured a successful bid to break a world record. Crowd management and event security specialist Showsec helped to enhance the reputation of what has now become the traditional grand finale to the festival season on the Isle of Wight as the impact of the company’s bespoke crime reduction measures contributed to the overall success of the occasion. This year’s event, which was themed the ‘Summer of Love’, saw Duran Duran, The Chemical Brothers and Missy Elliott headline the Main Stage on each of the festival’s three show days. In a continuation of a long association with the Bestival team, Showsec’s summer programme drew to a close in the picturesque surroundings of Robin Hill Country Park, but it’s a link which also includes sister event Camp Bestival and a new addition this year, namely Common People. A prominent feature of Showsec’s operation was the strong presence of senior management heading up the team throughout the event. While director Mark Logan acted as head of security, three of the company’s regional managers – namely Steve Reynolds, Scott Anderson and Richard Church – took on key responsibilities. Further support was provided by five area managers working across the whole operation. As well as directing its own operations, Showsec also played an important part in the co-ordination of an army of Oxfam volunteers providing stewarding support. Nowhere was that more effective, in fact, than when it came to working closely with officers from the Hampshire Constabulary on crime reduction measures designed to help make Bestival 2015 a safe and secure environment. Hampshire Constabulary reported a 26% drop in the number of reported criminal incidents for this year’s event, while enhanced searches involving Showsec staff, detection dogs and police advisors ensured that substantial quantities of drugs were confiscated at the entrances. Among the many other attractions, the world’s largest disco ball was back after successfully achieving an entry into the Guinness Book of World Records in 2014, while the unofficial record bid on this occasion saw 446 people become the largest number of buskers to sing a song in one place. 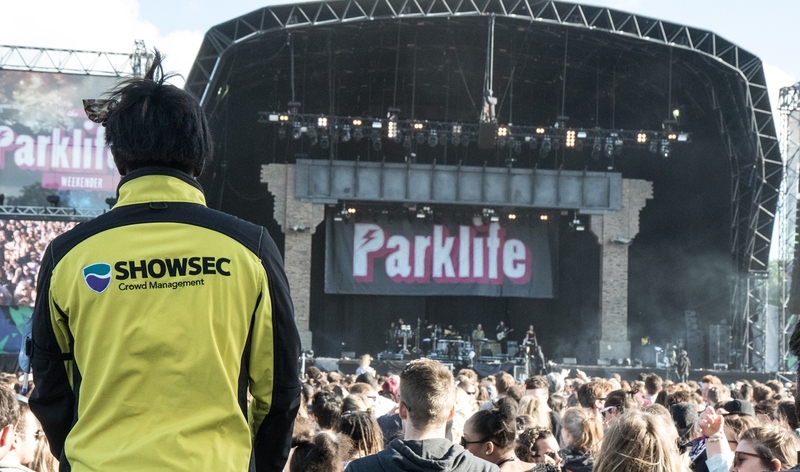 Showsec has been acclaimed for new crowd management measures which helped to make the Parklife 2015 Festival even bigger and better for attending fans. Thousands flocked to Manchester’s Heaton Park for the music extravaganza which opened with a concert from The Courteeners followed by a spectacular line-up of performers across the weekend. The crowd management and event security specialist worked with the event organisers and other agencies to provide the best-possible experience for fans who wanted to see the likes of Rudimental, Disclosure, Fatboy Slim and Mark Ronson. Much of that planning was focused on ingress and egress arrangements for the 70,000 revellers who came and went on each of the days of this increasingly popular event. The sheer scale of the attendance and the fact that there’s no camping for the visiting public makes Parklife one of the biggest festivals of its kind in Europe. On that basis, there’s necessarily a considerable amount of emphasis placed on ingress and egress to minimise disruption when so many people arrive and then leave in a short space of time. In his capacity as security director for the event, Showsec’s Mark Logan headed up the planning and then the implementation of the crowd management strategy. One feature was an innovative new queueing system. Showsec deployed more than 2,000 staff across the three days of the event. Alan Wallace (regional manager, North), Mark Wilcock (area manager, Greater Manchester) and Axel Fernandes (operations executive) were key members of the project management team. In addition, Showsec has secured a new agreement to extend a long-standing association with Nottingham’s Theatre Royal and Royal Concert Hall at what is undoubtedly a time of huge historical significance. Showsec will continue to provide its services for two of the United Kingdom’s most successful touring venues for three more years. That means the company will play an important role later on this year in the 150th Anniversary celebrations of the Theatre Royal which first opened its doors back in Queen Victoria’s reign. While the Theatre Royal has long been established as an iconic venue in the entertainment world, the Royal Concert Hall also attracts many high-profile events and artists. “We have been working with the Theatre Royal and Royal Concert Hall for many years now, so we’re delighted to be presented with this fantastic opportunity to extend that association,” commented Joe Milner, Showsec’s area manager in the East Midlands. 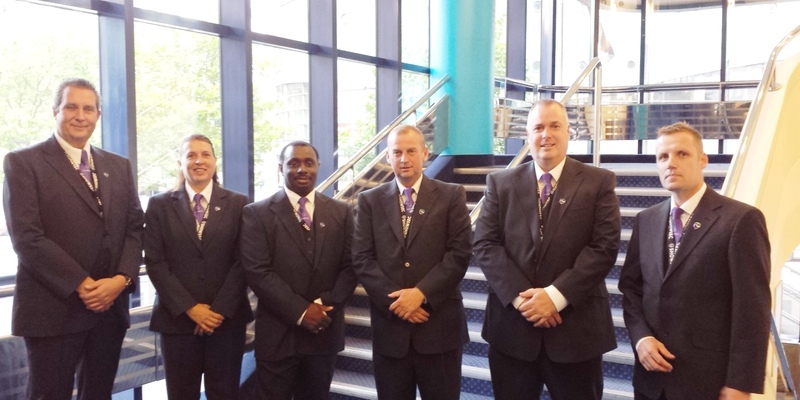 Last year, the refurbished Royal Concert Hall re-opened on the same night that Showsec staff wore their new three-piece suits for the first time. The smarter, more professional image has certainly been well-received and that has been a contributory factor in the cementing of this long-term association. Showsec has completed its own equivalent of football’s coveted ‘double’ by playing a key role in the celebrations for each of the 2014-2015 Barclays Premier League and FA Cup winners. The crowd management and event security specialist mounted a major operation for the victory parade to mark Arsenal’s record-breaking FA Cup triumph at Wembley Stadium just six days after the company had featured prominently in supporting and safeguarding Chelsea’s Premier League victory party ten miles away in West London. Thousands of jubilant fans lined the streets of the capital to hail their heroes following a season in which the London rivals shared all of the domestic honours – the Premier League and Capital One Cup going to Chelsea, with Arsenal victorious in the FA Cup and Community Shield. The victory parades gave Showsec another opportunity to demonstrate its capacity to be right at the forefront of delivering safe and secure large-scale public events in the capital, while also affording the Leicester-based business the chance to work closely with both clubs’ management teams as well as other key stakeholders. In the case of Chelsea’s celebration, Showsec was engaged once again by Innovision, the production company with whom it has worked to deliver safety and security for a number of high-profile occasions, the most recent of which was the third stage of the Tour de France’s Grand Depart last summer. 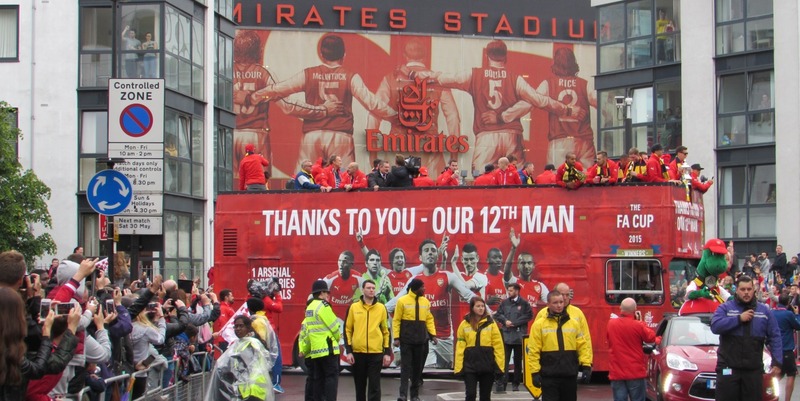 For Arsenal’s second successive FA Cup triumph, Showsec worked with the north London club to activate an extensive crowd management and security operation within hours of the famous trophy having been presented at Wembley Stadium. The strength of the stewarding team fielded on both occasions proved to be a crucial factor in successful project delivery, leaving regional manager Steve Reynolds (who served as head of security for both victory parades) to highlight the way in which key members of the Showsec brigade stepped up to the challenge. While Dayo Adelugba (Showsec’s area manager for West London) operated in key roles alongside Reynolds on both occasions, operations executives Michael Asimonye (dedicated to the Chelsea event) and Harry Thorn (who worked on the Arsenal victory parade) were given the responsibility of acting as project managers. There was also influential support on hand from many other members of the Showsec operation. Event security and crowd management specialist Showsec has won a new contract with one of the UK’s most iconic sporting venues. 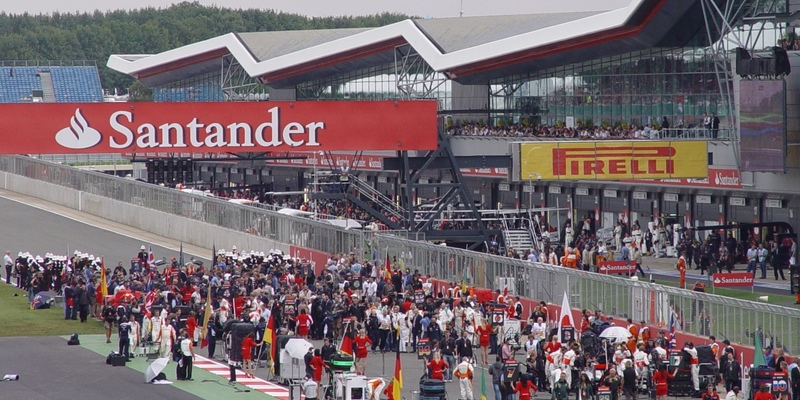 The company is now providing its services at Silverstone, the world-renowned home of the Formula One British Grand Prix as well as many other high profile motor racing events in the sporting calendar. The contract win represents a highly-significant development for Showsec as the company endeavours to develop an even stronger presence within the world of sport. The greatest events in British motor racing take place at the Northamptonshire circuit during the course of a packed programme which runs from the end of March right through to the beginning of November. Showsec is now drawing on its strong management infrastructure to lead operations at Silverstone over the coming months. The contract delivery will be headed up by Church and East Midlands area manager Joe Milner. Further support for account manager Chris Senior will be provided by area managers Ieuan Fury and Louise Stockden.